First: Ain’t a damn thing wrong with quartz. But there is certainly something wrong with someone projecting their tastes in watches (or clothing, or shoes) onto others in the form of snobbery. There’s hardly anything more insufferable than a watch snob who just aches to have someone notice what’s on his wrist. Second: There’s just something about automatic and mechanical watches. It’s hard not to be impressed by their movements powered by tension, springs, and gears, all without the aid of that newfangled source of power known as “electricity”. To some (and not all), they’re the difference between candle light and a dimmer switch. They might sometimes look the same, but the romance is superior with the former. No matter what camp you’re in, the following are all lookers for less than what the dude in the corner office is sporting (& is hoping you notice at lunch). As always, buy and wear what you like and can afford. Hard to go wrong there. One of many color options. As rare as a liger. One of the best, and hugely difficult to find. Comes with a stainless steel band but looks incredible if you swap that out for leather, a fabric NATO, or even a silicone strap. More on this line over here. Sea-Gull makes a full quarter of the world’s automatic watches. They are the biggest. And while a lot of their designs can drift into the strange, they’ve got a couple option that look like they were pulled straight from an estate sale. Some flash, for sub $200. It’s a relatively recent addition to the Orient lineup (did it come out in late 2011? Early 2012? ), and it might eventually displace the Mako dive watch as the brand’s flagship. Heirloom looks without the I-need-an-inheritance price. Domed crystal is a well executed throwback style, and the 41.5mm case is the perfect width for most. More here. Mid brother and Big Brother. Of course it’s sold out. But at least they’ve made a mid-size in the new style for 2013. The regular, 46mm Maratac Pilot is BIG (full review over here) so plenty have been waiting on a mid-size. It’s coming, or, it was here and now gone, but it exists. Maybe. Somewhere. Still wish they’d make one around 41 or 42 mm since the mid sized option is a smaller 39mm in diameter. Be not afraid of the XL. In this world of vanity sizing, an XL shirt means it’s going to fit a human of epic proportions. So you’d think the Orient Mako XL would be the size of a grandfather clock. Not so. It’s certainly on the larger size at 44.5 mm in diameter, but it wears a bit smaller. It doesn’t swallow up an average sized wrist, and it should be proportional for you big fellas. Available in a few different dial and bezel combos. Standby for a full in person and giveaway in the not too distant future. A casual can be timeless, right? Was $385 during the sale. These only come around once or twice a year, but if you get on their mailing list, you can get access to “nearly new” watches at a bit of a discount. For example, during the last sale, a Nearly New C60 Trident was going for $385 and it wasn’t final sale. When it showed, it wasn’t for me (a bit smaller than expected) and they were good enough to reimburse me to ship it back to the U.K. Great customer service out of them, and the watch was stunning in person. Careful, the white dial option was just being fulfilled by Amazon, but have since gone to a third-party only (the more expensive black dial is still being fulfilled by Amazon). Hard to find, but if you can get your hands on one… it’ll likely knock your socks off. The step up stainless case hints at art deco, while the white dial and hands are razor sharp. Runs on the relatively new Swiss Made C01.211 movement. Pushers are crisp and snappy. Sapphire Crystal. Exhibition case back. A perfect for plenty 42.5mm in diameter. Up there in price, but finding a Swiss Made chronograph with these kinds of looks for under $700 is no easy task. What else? Anything that should be added to the list? Leave your favorite affordable automatic in the comments. I missed the Valentine sale for the Christopher Ward malvern C3 chrono (thought that the codes works well into march for whatever stupid reason) AND IS NOW KICKING MYSELF IN THE FACE! Its fantastic and you can now get them in a larger 42mm size and in 2 new colors. Although the diehards like me will stick with the original. I pretty much settled on the C8 Pilot MKII – Vintage with this sale. I waited until Valentine’s day to make the purchase. Turned out the code was only good through 2/13. D’oh! Yowch… prices on these have sure jumped. I don’t know if I would trust that link for the SNZJ5, the Seiko 5s and similar style watches are some of the most counterfeited models in the world. You need to buy those from a reputable dealer or at least someone with a no questions asked return policy. You serious? Not only is Amazon one of the best grey market watch sellers, but they also have one of the best watch return policies on the web, including free return shipping on most watches. Is that yours? Because I am super jealous, beautiful. They really have, two weeks ago around 650. That must be the first time in the history of this website that someone went the opposite way, and instead of linking to a strange off the wall website with a too-good-to-be-true price, encouraged buyers to be MORE careful. Agreed that it’s awfully sketchy out there. Everyone has their own rules, but my own personal rule is to at least have Amazon fulfill the purchase (meaning, they have the watch in their warehouses, and handle all returns, etc…). Super easy that way, and that also means the behemoth that is Amazon has some skin in the game. Thanks for the reminder about the online watch market. Always good to be extra careful. One note: They’re manual, not automatic. But probably the best value manual out there. 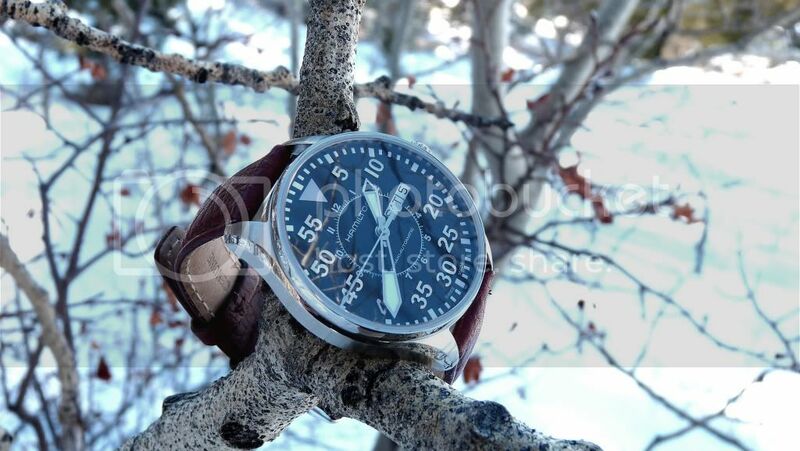 I bought one of the 42mm’s and stuck it on a Flieger strap. I love it. I own that first Seiko in black and love it as a casual watch, largely because of its small size. It seems like every watch is well over 40 mm these days (even supposedly vintage-style watches like the Orient Bambino), but to me the ideal watch size is more like that 38 mm Hamilton Field Khaki or smaller. I recently inherited a 1970s Hamilton “Thin-o-matic” from my late grandfather and it’s definitely going to see a lot of wear, not just due to sentimental value, but because it’s a beautiful dress watch in a small size that almost no one makes anymore for some reason. Yeah… they were under $600 a couple months ago. BenR I wasn’t talking about Joe’s link through Amazon, I was talking about the one posted below by Douglas Wylie–it’s a great price but very sketchy website with an even sketchier return policy (returns accepted at company discretion). Joe, appreciate the comment and I agree, I generally have no qualms if Amazon is fulfilling an order because I can just ship it right back if it’s not upto snuff. The whole third market coming from Singapore reeks of “something is rotten in the state of Denmark”. I wish I had the link but WSJ or NYT had a list of most counterfeited watches in the world and the Seiko 5 models were at the top of the list. Gotcha… I was a little concerned for a moment. Wow, that is quite stunning. Well done. This watch has been on my list ever since I set eyes on it (online). Thanks for the further info. I think the CW C60 is the perfect size for my 7 incher. 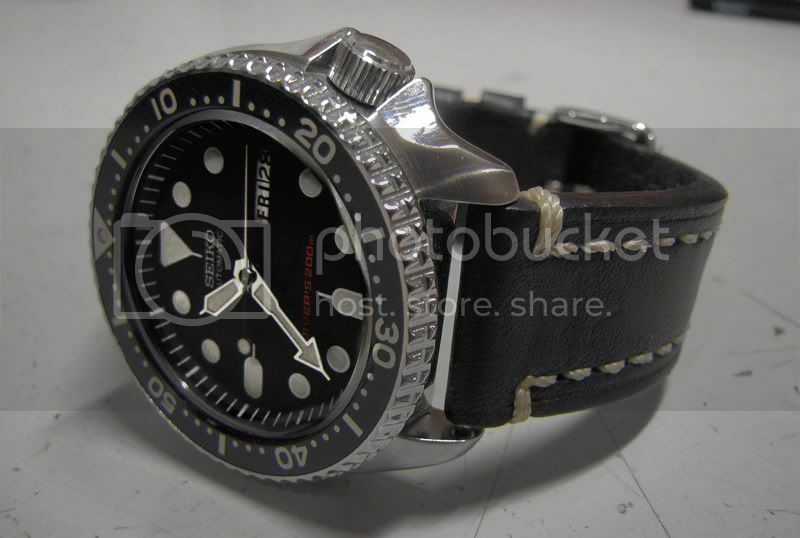 If you’re looking for an in-your-face blingfest of a diver, there are certainly better choices, but I paired mine with a Hirsch leather strap and the combo looks great dressed up or down. I also like it with a NATO for really casual. The C60 is noticeably larger than the Orient Ray and Mako (I have the Mako), which are regularly pimped on this site. The Hamilton Khaki Field can also be purchased with a silver dial, making it an effective bridge between casual and psuedo-formal. Friends, in the United States, we have the right to reverse charges for not receiving goods as promised under the Truth In Lending Act and Electronic Fund Transfer Act. This means if you get a fake watch, or if it is broken etc… you call the credit card company who will investigate and routinely reverses charges on just this kind of thing. So, if you use a US credit card, you get an automatic guarantee to receive an item as described and fully functioning or your money back. i’ve been thinking about the orient bambino for awhile now. im torn between the stainless steel or the rose gold. rose gold rarely gets mentioned here at dappered and i’m wondering if that’s cause the stainless steel just looks that much better? thoughts? Avoid, if I were you, the Orient watches. I own three: the Mako, a World Time Executive and another – and honestly, after a couple years of ownership, I’m not impressed. The Mako is holding up best, the WorldTimer – $400 at the time of purchase – is faring Okay, but the crown used to adjust the time is wonky and unreliable and seems likely to break, and the third one, a $125 mechanical dress watch (no longer available) just died. Meaning: it won’t wind. Ugh. I just got the same Seiko in the mail today. Loving it so far, especially the size. It’s very versatile and a tremendous value. Very nice. Where did you get that strap? Thought I would participate, though I realize it’s an old thread. I bought a Steinhart watch (http://www.steinhartwatches.de/en/) about a year ago based on multiple recommendations from watch geek sites. I love it! I wore an Orient Blue Ray before this arrived. The quality has about 10 notches on the Orient…I pulled it out couple weeks ago on a whim and took it off an hour later and will probably never wear it again. The quality difference is significant. The cost is bit more, but falls into this discussion, it was $400 ish shipped. Got the Bulova as a gift from my wife and absolutely love it. Never have to wind it unless I leave it off for a few days. Drooling over the Hamilton Khaki, but that’s a bit more change than I’m ready to shell out yet for a watch. I’m confused. You said you love the Steinhart, but then said you took it off and will probably never wear it again. So is it worth getting or not? Sorry for the confusion…I havent worn the Orient since that post. I believe the Steinhart is worth getting and really like it.